1. Mix peppercorns with 1/2 teaspoon sea salt. Brush steaks with a little oil, then coat evenly in pepper mixture. Set aside. 2. Heat butter and half the oil in a frypan over high heat. Add eschalots and stir for 1 minute until softened. Add mushrooms and cook for 1-2 minutes until wilted. Turn heat to low, stir in thyme and flour and cook for a further minute. Add wine, Worcestershire, paste, mustard and stock. Stir for 1-2 minutes until slightly thickened. Remove from heat. Set aside. 3. Heat remaining 1 Tbsp oil in a separate frypan over high heat. Cook 2 steaks for 2 minutes each side for medium rare. Transfer to a plate and cover loosely with foil while you cook the remaining steaks. 4. Return mushroom sauce to stove and reheat gently. To serve, place a dollop of mashed potato on each plate. 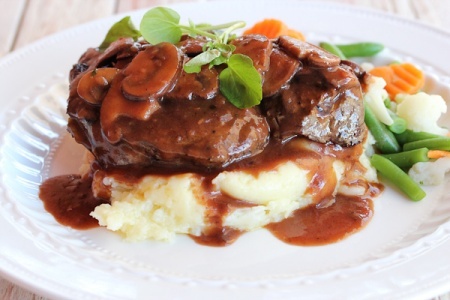 Top with steak, mushroom sauce and watercress.